What is your attitude to failure? How do you react when you lose a Jiu-Jitsu match or have a particularly bad day at training? The answer to these questions may indicate whether you have a fixed or a growth mindset. It is not always obvious but generally people tend to have one or the other. Applying a growth mindset to your Jiu-Jitsu may help you to improve your game and can be beneficial in many other areas of your life. Carol Dweck is a psychology professor at Stanford University and is famous for her work on the mindset psychological trait. Dweck’s research challenges the common belief that intelligent people are born smart. Based on this research she has written extensively on the benefits of having a growth mindset. 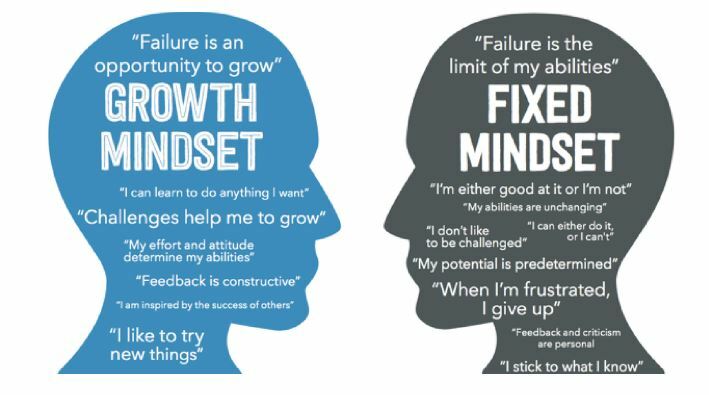 The good news is that you can change from a fixed to a growth mindset. Learning about the growth mindset is sometimes enough to put people on the path to changing previous held beliefs. Jiu-Jitsu is a perfect opportunity to test out the growth mindset. Development and progress can be clearly measured though your ability to perform certain techniques, your grade, and your ability to compete with other students. In the case the fixed attitude student is less likely to figure out how to get more and is more likely to quit. On the other hand the growth mindset student will soon figure out how to counter the opponent and may even develop a sequence to get the dominant position. Getting tapped out regularly and finding weaknesses is your game should be viewed positively. They should be seen as opportunities to learn and develop. Take the example of the greatest tennis player of all time Roger Federer. Many people credit his success to natural talent. However it is the thousands of hours that he has spent perfecting his technique and refining his game that has made him so talented. Even as he reaches the twilight of his career he famously continues to put in the hours of training and researching opponents in an effort to win as many major championships as possible. In 2017 he won his first major championship in 5 years at the age of 35 despite most pundits stating that he had come to the end of his reign. If you are a regular reader of sports biographies you will notice that this is a common trait among the greatest athletes of all time. Many of them give examples of athletes with similar abilities at young age, but what elevated them above their peers was the skills that they cultivated through deliberate practice. The phrase “Win or Learn“ has become somewhat of a cliché in Jiu-Jitsu and MMA but if you actually take a bit of time to think about it and apply it to your own martial arts journey you will likely see some benefits. So when you get your next set back in Jiu-Jitsu try to view it as a challenge and be grateful for the failure. Failure should always be viewed as a springboard for growth. Get addicted to failure! It will make you a better Jiu-Jitsu player. This entry was posted in Article and tagged bjj breaking grips, bjj failure, BJJ growth, bjj mindest, bjj opportunity, bjj psychology, getting better at jiu-jitsu by byronjabara. Bookmark the permalink.